A poster job for us normally begins with listening to the headliner and doodling. We try to capture in images what the music feels like to us. With this Trampled by Turtles poster, we were given the added responsibility to honor a great Richmonder, Ralph White. If you’re unfamiliar with Ralph White, he is the director of the James River Park System and he’s retiring in January of 2013. Chances are if you’ve visited Richmond or live here, you’ve been to an area that Ralph White has helped shape. From educating people about nature to helping salamanders have a safe place to do the hanky-panky, he’s left his mark on our little corner of the world. 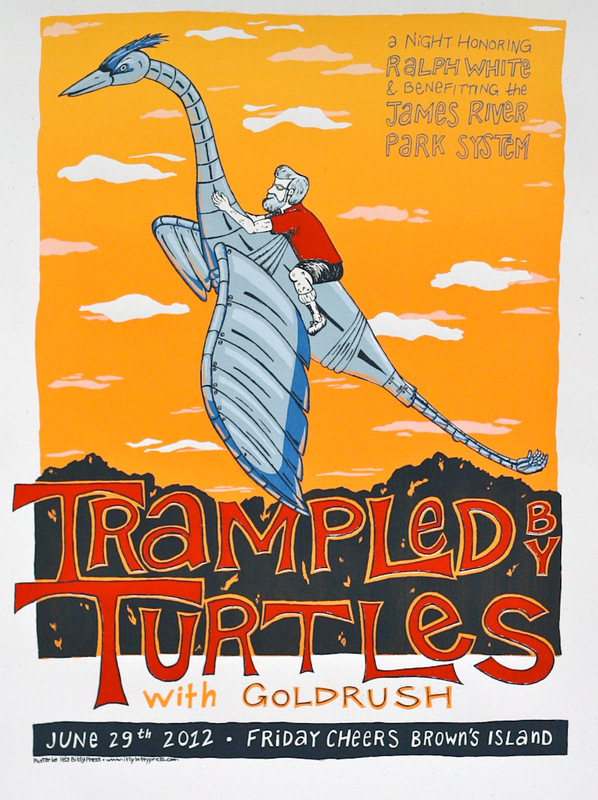 Come out to Brown’s Island tonight to enjoy Trampled by Turtles and Goldrush. They’re sure to rock your socks off and you can nab this poster for $20 while you’re there. If you can’t make it tonight, we’ll have it up on this site this Monday for the same price. If you’re interested in the process, check out our facebook photos! Previous post: Double your fun!